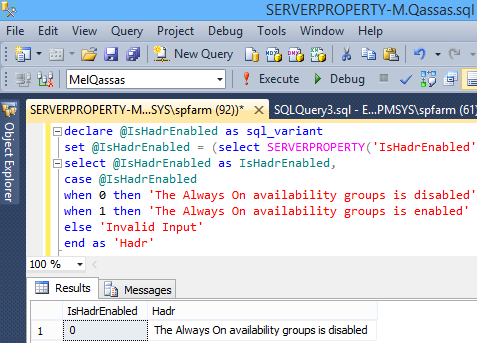 Let's learn how to check if the "Always On" Availability of Groups is enabled or disabled using SERVERPROPERTY in SQL Server. In this blog, we will simply see how to check if the "Always On" availability of Groups is enabled or disabled using "SERVERPROPERTY" in SQL Server. Use ISHADRENABLED property to check the status of "Always On" availability of groups.